Hmmm. Am I going too far here? Some of you disowned me when I put sprouts in a quesadilla. But I mean, this is just lasagna. So it’s basically veggie lasagna. Wait. Did you hear that? VEGGIE LASAGNA. Here! The Brussels sprouts… ugh. I just cannot stop. I am in love. It hits me every autumn but it’s never been like this. It reminds me of when I finally decided that I liked kale and that relationship is still going strong. So I’m hopeful. Maybe I’m also reaching. How many of you can I really convince here? Brussels in your lasagna? Are we making this a thing? So I didn’t care for lasagna when I was a kid because of… tomato sauce. Yeah I know. But I just wasn’t a big lasagna person. My dad pretty much refuses to consume anything casserole-like or a bunch of ingredients thrown together in a dish so my mom never made it. When I got married, Eddie had no interest in lasagna because he “hates” ricotta cheese. Spoiler alert: he’s now eaten it about 50 times in the last five years because I’m the ultimate trickster. It wasn’t until I made this butternut sweet potato lasagna a few years ago that I was hit with the lasagna bug. Then back in October I had Heidi’s version which I have made twice since because I just can’t quit it. Brussels just happened to be the next logical step. 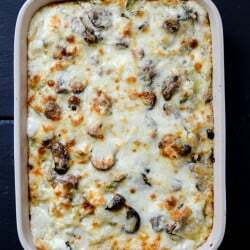 Anyhoo… this lasagna is also full of garlicky mushrooms, lots of cheese and whole wheat no-boil lasagna sheets. These sheets are the same ones I’ve used in my other lasagna recipes and are by far my favorite. So freaking simple! This is also what happens when you’re a food blogger and run out of dishes. I’m pretty sure these little plates aren’t even real dishes. Totally meant to be decorative. Not any more, says I. I walked in my into living room, grabbed them off the table, washed them and threw this lasagna on top. I even ate it right off of those plates too. So much class. So much. Preheat the oven to 400 degrees F. Spray a 9×13 baking dish with nonstick spray. Heat a large skillet over medium heat and add 1 1/2 tablespoons of the olive oil. Add the brussels, shallots and 1/4 teaspoon each of the salt and pepper, stirring to coat. Cook until the sprouts soften and become bright in color, stirring occasionally, for about 5 to 6 minutes. Stir in the balsamic vinegar and cook for another minute. Remove the sprouts from the skillet and set them aside in a bowl. Using the same skillet, add the remaining olive oil. Add the mushrooms and garlic, stirring well to coat. Cook until the mushrooms are soft and juicy, stirring occasionally, about 6 to 8 minutes. Turn off the heat and add 1/4 teaspoon each of salt and pepper. In a saucepan, heat the butter over medium heat. Once it’s sizzling, whisk in the flour to create a roux. Cook the roux for 2 or 3 minutes, until it becomes golden and fragrant. Whisking with one hand, slowly stream in the milk, stirring constantly as the mixture comes together. Cook the milk, stirring constantly, until it starts to thicken, about 5 minutes. Season the mixture with the remaining salt, pepper and nutmeg. To assemble the lasagna, add about 1/4 cup of the sauce to the bottom of the 9×13 dish. Add a layer or lasagna sheets, then top with 1/3 of the brussels and 1/3 of the mushrooms. Sprinkle on 1/3 cup of cheese and using your fingers, sprinkle on 1/4 cup of the ricotta. Drizzle 1/3 of the sauce on top. Repeat that layer two more times. Finish off the lasagna will any of the remaining cheese, the pecorino and the remaining sauce, evenly drizzled on top. Bake for 30 to 35 minutes, or until the top is golden and bubbly. Let sit for about 20 minutes before slicing. I like to serve this as a side dish or as a main meal with a large salad. The cheese makes up for everything though. This looks great!! What a great way to prepare brussels sprouts. One — I have those plates and eat off them. Two — Keep putting Brussels Sprouts in EVERYTHING. My favorite veggie. I’m a veggie hater too, but one day, I ate them roasted just to appease someone. I knew it was love when I ate them cold out of the fridge the next day and just could not stop shoving them into my mouth. I LOVE all your brussels sprouts recipes! I haven’t made lasagna in ages, it must happen soon!! I respect you even MORE now for making this lasagna!!!! So I eat a mostly gluten free diet (depressing I know) and I could not find GF lasagna noodles so I just bought the penne ones and made this as like a baked casserole layered thing…SO GOOD! I love your brussels obsession. I also have one. i am constantly looking for excuses to eat them, and I am even known to just eat a bowl of them as a meal. So good. Thanks for the post! This. All of this. Forever and ever. Amen. I like brussel sprouts, and I love meaty, cheesy lasagna, but I’m drawing the line here. Vegetable lasagna is , how do I say this nicely . . . . Yuck. Load up the cheese and the beef and keep the vegetables on the side, please! I may need to change my menu plan for the week now. Brussel sprouts in lasagna is a-ok by me! Mmmh this one of a kind to use brussel sprouts …yummy. Will try it next week!!! This was DELICIOUS! I subbed braised butternut squash for the mushrooms owing to my husband not being a big fan. The sweetness from the squash really worked well with the tangy Brussels sprouts and then the mellow cheese and sauce….so good! Keep it coming with your ‘trashy’ dishes!!!! I LOVE this recipe, Jessica! I’m sort of on a brussels sprouts kick right now. I’ve been eating them roasted with bacon but I think I will have to give this lasagna a try. YUM! I made this yesterday and even though I didn’t get the “no bake” lasagna ( by mistake) or sliced my brussels sprouts ( a lil lazy) …it still came out super yummy! I know that when I fully follow this recipe next time it will be super super yummy!! I cook usually new recipes 4-5 nights a week and this was the best new thing I’ve made in a long time, it was amazing. Just yum. I’ve never used no boil noodles before, they were good and saved a little time, start to finish, it took me around 2&1/2 hours, but totally worth every second. Made this recipe and my fiance is demanding that I make 3 batches for Thanksgiving or the next big holiday. Thanks so much! It’s delicious!